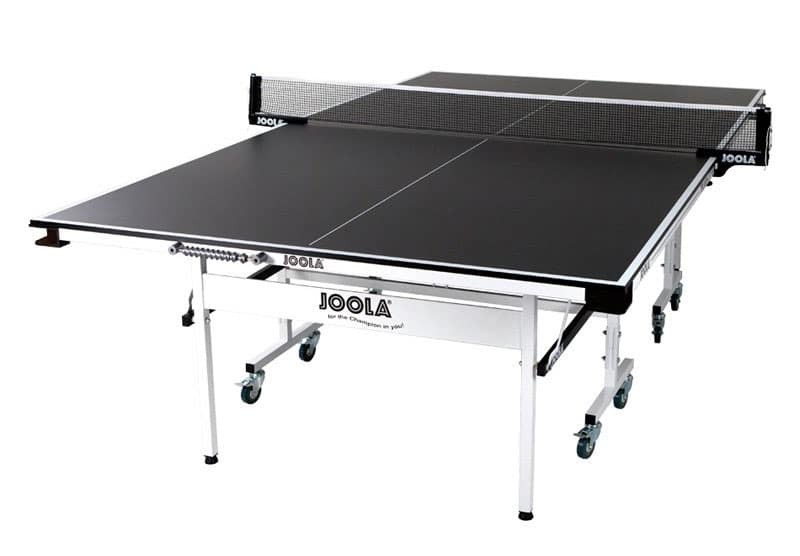 First of all, the JOOLA Triumph 15 Table Tennis Table can be categorized as a well-constructed table. Alternatively, it is also known as Rally TL 300 for it’s model. It is ideal for you to buy the table and place it inside your recreation room or basement. The table is features with 30 x 30mm white metal undercarriage, own trolley system and automatic folding legs. The surface of the table is constructed with superior and top-quality MDF which make it very sturdy and well-performing. In addition, it also has a net and post that send together when the table is delivered to your doorstep. Also, you will receive a corner ball holders included in the apron as well as a pair of magnetic abacus-style scorekeepers. This JOOLA Triumph 15 table is especially fit for beginners or family who would love to have some exercise by playing the game during their leisure time. For advanced players, they may observed the playing surface isn’t of finest quality as it didn’t provide them with good bounce quality like the other higher-price tables do. 15mm charcoal-painted MDF playing surface. Two-piece top with automatic folding legs and trolley system for easy mobility. Corner ball holders and sliding abacus magnetic scorers. Double Anti-tilting device and fold-up playback mode. If you buy the JOOLA Triumph 15 table tennis table, once the table delivers to your house, you may un-wrap everything and then you will take about 20 minutes to set it up. The table is having a 15mm Charcoal Painted MDF Surface which allows a sturdy and recreational play for you and your family. The extra pieces of equipment like the detachable magnetic scoring device and corner ball holders are provide a lot of convenience when playing the game. Many people are buying this table due to it has the double anti-tilting device which make the table very safe when handing the table. While not all ping pong tables in this price range offer you with levelers on the legs, you will be grateful that this JOOLA Triumph 15 does did offer you with such features. This made you to have less hassle to deal with uneven floor surface on carpet or in steep cellars and garages. After all, it is best for you to bear in mind that the most important decision that you need to make while deciding on which table tennis table to buy would be how well the playing surface can provide you good bounce. If the table can provide you with great bounce at affordable price, then it should be a bargain for you.